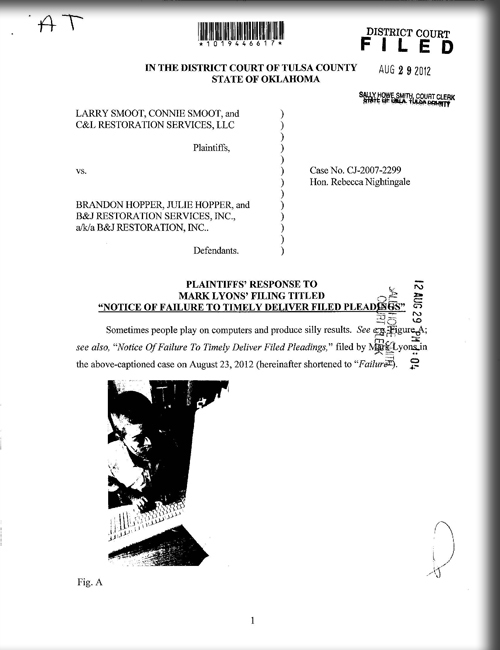 An attorney from Oklahoma alerted me to a recent paper scuffle that took place in the District Court in and for Tulsa County. Apparently a civil defense attorney took issue with the plaintiff’s attorney’s alleged habit of delay in mailing pleadings and filed with the court a “Notice of Failure to Timely Deliver Filed Pleadings” in which he decried the constant and persistent problem of late mailing. The judge in the case apparently did not find the pleadings nearly as amusing as I did, as she filed an “Order Striking Pleadings,” cautioned the attorneys to conduct their legal affairs before the court “with great caution,” and proceeded to hold a Civility Conference with counsel for all parties in attendance.